Bhupesh Baghel Is Appointed Cheif Minister Of Chhattisgarh, Decision Taken In Meeting Of Legislative Party: After the long suspense, the name of the Chief Minister of Chhattisgarh has been announced. The state's command has been handed over to Bhupesh Baghel, who is leading the race so far. After Madhya Pradesh and Rajasthan, Congress President Rahul Gandhi had to make a lot of efforts in deciding a name in Chhattisgarh. The decision of Chhattisgarh was difficult because of those two states because there were no two or four contenders. At last, Bhupesh won the race However, its official announcement is yet to be made. Bhupesh Baghel is the head of Congress state committee Bhupesh Baghel, who belongs to the peasant family, is known for his aggressive position in the political corridor. Congress has won 68 seats in the 90-seat Chhattisgarh assembly. The victory of this victory is being built on the head of Baghel because he has made all the strategies for assembly elections and elections in Panchayat elections. Bhupesh Baghel has fought for the party for a long time on the streets. He also faced the Raman Singh government as well as the challenge from Ajit Jogi, separated from the party. Baghel, who belongs to the Kurmi Kshatriya family, has said on the party's victory in the state that Rahul Gandhi had entrusted him with the responsibility of giving a majority to the Congress in Chhattisgarh and he did it. 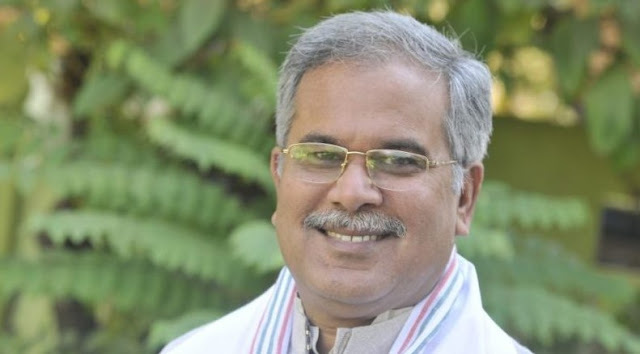 Born on August 23, 1961, in the fort of Chhattisgarh, Bhupesh Baghel started a political shift in the '80s with the Congress. He became Youth Congress President in Durga district. He was the President of District Youth Congress Committee, Durga (Rural) from 1990 to 94. He was also director of Madhya Pradesh Housing Board from 1993 to 2001. When Chhattisgarh became a separate state in 2000, it reached the Assembly from Patan seat. During this time he became the cabinet minister too. In 2003, when Congress was out of power, Bhupesh was made Deputy Leader of the Opposition. In 2014, he was made the Chhattisgarh Congress president and since then he is on this post.